This picture is rather amazing---we can only imagine. 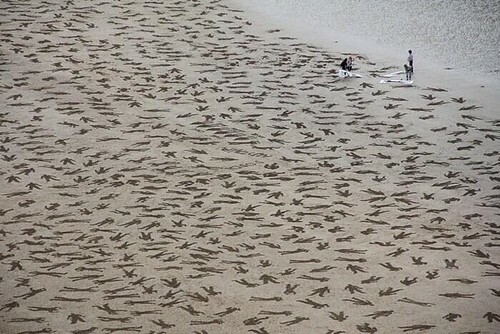 As the daughter of a WW2 vet (although he was not involved in this invasion), they have all my respect. Thank you to all. This is why we must guard our wonderful country now---so these people did not lose their lives in vain. My husband is in Juno Beach today with a group of 120 cyclists raising funds for Wounded Warrior Canada. They will be riding over 700kn visiting Canadian battlefields and cemetaries and other memorials of importance to Canmadians across Normandy ending at Vimy Rdige. If you are on Facebook check out "Matt's Battlefield Bikeride" page. Mike you set the mood of the day with this remembrance. I have thought a lot today about holes in my [Canadian] reading. For example, I've seen 'The English Patient' as film but never read it. I've long been interested in Farley Mowat's northern experience but never read 'And No Birds Sang' or other works inspired by the war experiences of 2nd. Lt. Farley Mowat. It might be a bit dark for 'summer' reading although much of the literature I prefer does include *types of* historical narrative which by necessity includes the more tragic elements of human history. But I think I'd like to see things within the context of an older Canadian generation who did so much for us then, and returned to make dramatic improvements in society. Those old guys who we took for granted. My Dad was also a WWII vet, though not in Normandy. He did, however, fight against both Rommel and then later the Japanese. He was one of the few lucky ones who came back. This particular D-Day was a very important remembrance (they are all important, of course) as so few soldiers are still with us. My dad had nightmares his entire life from his WW2 experiences. to 'stay in place' until his death in 1975? to destroy the town Guernica in 1937. Brave brave men indeed. They were so young, and the sacrifice they made knowing they may never return, is unbelievable. I take comfort in the knowledge the under 20's today have of these events. My father is a WW2 vet (Merchant Navy) and is asked many times a year to speak to Air and Sea cadets, Cubs and Scouts to help inform them of the sacrifices they made. He always starts with, I never had to take another's life, but i saw many of my mates die as their sacrifice for freedom. As far as the USSR and the western allies was concerned, the old proverb 'the enemy of my enemy is my friend' would apply.